In this section, we’ll go over how to design CD pipelines that build and publish an application image. As an example, we’ve used a sample nodejs application called ‘Bulletin Board’. We’ll be building our application as a docker image artifact and publishing it to Docker Hub. To do this, make sure you have a Docker Hub account. Click on the Pipelines link on the top menu to create your first pipeline. 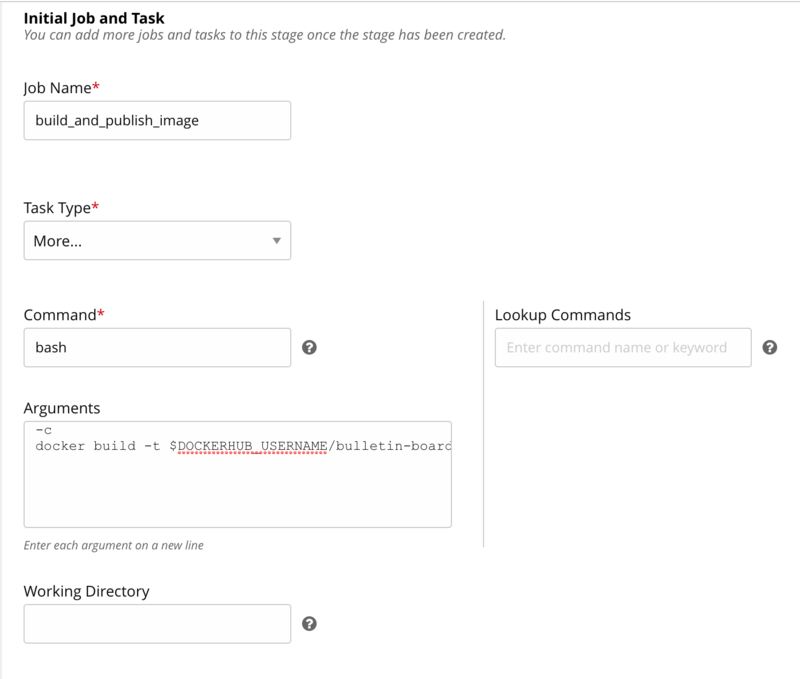 Specify the pipeline name and the group name as build_and_publish_image and kubernetes_app_deployment respectively. Specify a git material with repository https://github.com/gocd-demo/node-bulletin-board.git. Create a stage called build_and_publish_image. The GO_PIPELINE_LABEL is an environment variable provided by GoCD which can be used to differentiate between builds from a repository. Here we are using GO_PIPELINE_LABEL to determine the application image tag. Note: This is the job that we have to associate with the elastic agent profile that we created earlier. Click on the Finish button when you’re done. This will take you to the pipeline settings page for additional configurations. Navigate to Environment Variables tab. 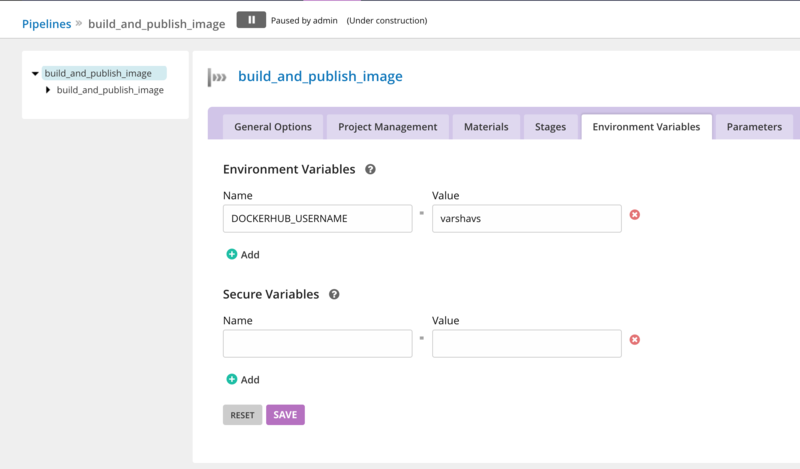 Configure the DOCKERHUB_USERNAME as an environment variable. 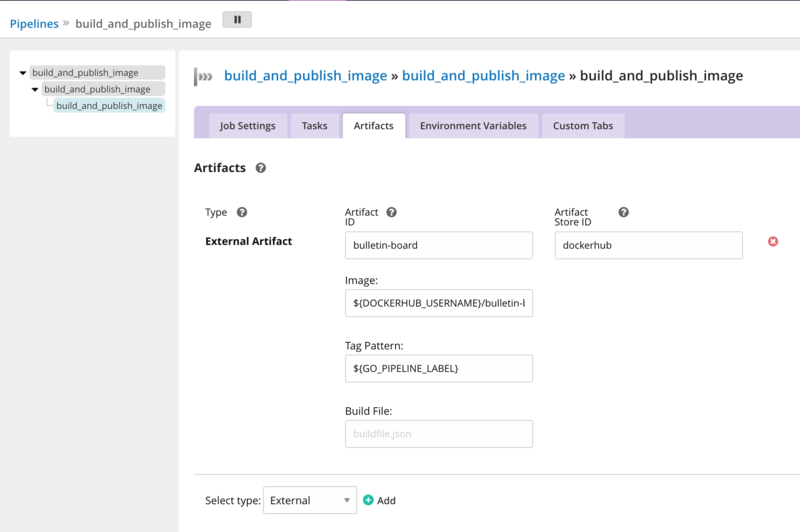 Navigate to the pipeline settings for build_and_publish_image. Tip: Use the tree on the left to navigate to the job build_and_publish_image. Once you’re here, you can associate the profile ID under the Job Settings tab. Create an external artifact under the build_and_publish_image job. This will ensure that the image being built by the build_and_publish_image job is the one being published. Note: You need to have an artifact store configured for this so that the plugin is aware of the credentials to use when publishing the artifact. Once you’ve associated the job to the profile demo-app, you’re ready to run the pipeline. Now that the pipeline has been configured, we can run it and verify that the docker image has been pushed. To run the pipeline, unpause the pipeline in the GoCD dashboard. The changes from the source git repository gets picked up automatically when the pipeline is triggered. This can be useful to troubleshoot when an agent is not picking up the job. Click on a stage of your choice when the pipeline is being built. You’ll see the stage detail page with a list of jobs. Click on the job that you wish to see the agents of. This is the job detail page which has a console log. Click on the button titled ‘Check Agent Status’. Note: The Agent Status Report is only visible when that particular job is running. Once the job is run, this status will not be visible. Once the pipeline has run successfully, you can go to your DockerHub account to verify if the image has been published. In the next section, we’ll look at how to configure a pipeline to test our sample application’s docker image.